In an age where virtually everyone is online all the time, social media is an effective way for businesses to attract new customers. And Twitter stands apart for its ability to connect companies with prospects who are actively looking for their products and services in real-time. In the same way that a tech company would use Twitter to drive traffic to their website, a brick-and-mortar business can use Twitter to get customers through the door. This guide offers five tactics to help you do just that. By following relevant hashtags, keywords, and key phrases on Twitter, you can easily engage people who want what your business has to offer. Of course if you’re operating a spin studio in New York City, showcasing your classes to a fitness fan in London isn’t likely to lead to a quick sale. The prospects you want to target are those who are in the best position to buy from you: the people in your area. If you use Twitter in the Hootsuite dashboard or on the Hootsuite mobile app you can create search streams that show only relevant Tweets from within your city, neighborhood, or even block. So, for example, if you’re trying to attract new customers to your coffee shop you can monitor all Tweets containing the word “coffee” and/or “bakery,” within a five-mile radius of your business (or whatever distance makes the most sense). Then click the geocode button (black cursor arrow). The last numbers on the end of the code will be your search radius, adjust to whatever distance makes the most sense for you. Click the “Add Stream” button and you’re done. And that search stream is saved in your dashboard for easy reference whenever you need it. Watch this video to learn more about using Hootsuite to find nearby conversations that are relevant to your business. Ideally the people you identify as prospects on Twitter will already be searching for your product or service (you know because they’ve been Tweeting about it). But if you can’t find someone like that, you can still use Twitter to introduce yourself to people in the area. The trick is to have something of value to offer. Give wayward tourists directions or help with a nearby restaurant recommendation (@mention that business and maybe they’ll return the favor). Avoid to spamming anyone with self-promotional Tweets. If your Home feed is filled with appeals for business without an offer of anything in return, you’ll turn off your followers pretty quickly. A helpful overture, on the other hand, is always welcome. If you run an artisan cheese shop it makes sense that someone walking out of the speciality wine store down the street would want to visit you next. You can make that happen by building a relationship—online and offline—with the neighboring business. Search for the wine store’s Twitter handle and start building rapport. If you engage with other business on Twitter you’ll be introduced to their loyal followers. Regular and positive exchanges between brands can serve as endorsements for all parties. Here’s a donut shop in Vancouver, B.C. promoting their product alongside their neighborhood ice cream shop. If the brands are especially complementary, you might consider launching a multi-store promotion. Create a Twitter List of all nearby business to keep an eye on these kinds of engagement opportunities. In the Hootsuite dashboard, you can set up the list to appear alongside your local search streams for easy reference. If you have some money to put behind your quest for new customers, running Twitter Ads will ensure your business gets in front of the right people. With the Twitter’s geo-targeting feature you can aim your ad at prospects within a certain metro area—or zero in on a particular zip or postal code. Once you have your location set, you can add more filters to further refine your search, choosing everything from audience interests and behavior, to language and gender. So, if you run social media for a chain of high-end women’s wear retail stores, you can target your ad at females who are interested in beauty (Twitter determines a user’s interests based on the topics they connect and engage with) in the cities and/or neighborhoods that your stores are located in. Learn more about how to effectively target your Twitter ads. All business owners understand the importance of good customer service. A happy customer is a returning customer—or even better, an advocate for your brand. And with more customers using social media to discuss their buying decisions, it’s imperative that you are listening for these conversations and responding. Of course not all mentions of your business on Twitter will be @mentions. In fact, the vast majority of people who discuss brands online don’t actually name the brand or follow their social media profiles (or they do name the brand but leave out the @ symbol or misspell the name). 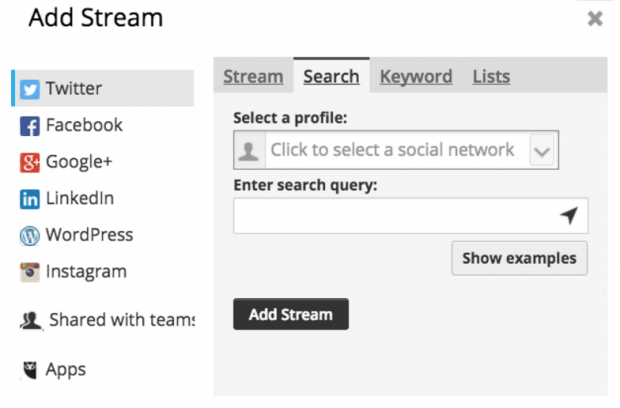 You can also set up search streams to find unbranded mentions in the Hootsuite dashboard. Click the “Add Stream” button, and you’re done. Watch this video to learn more about using Hootsuite to find Twitter conversations that are relevant to your business. Once you have the stream set up you can easily respond to all comments, compliments, and complaints. This will demonstrate to your customers and their followers (potential new customers!) that you are committed to making them happy. You might also want to consider tapping into the influencer marketing trend to drive business to your brick-and-mortar store. This starts with finding the right influencer—someone your target customers are already engaging with. Using Twitter’s advanced search function to uncover these people, you can ‘Like’ and respond to a few of their Tweets and begin to build a relationship. Once you’ve established rapport, you can @mention the influencer in a Tweet directly. By conversing and engaging with influential Twitter users in your area, you’ll likely see an increase in engagement from their followers. Dive deeper into this tactic by reading our previous blog, How To Use Influencer Marketing To Grow Your Small Business. Put these business-driving Twitter tactics to work and you should have new customers coming through the door in no time. Manage your Twitter presence—and drive foot traffic to your business—with Hootsuite. Try it free today.